The WCA barometer holds steady through April, tactical stock / bond mix unchanged. The last month’s data show signs of resilience following a sharp spike in volatility in February and March. 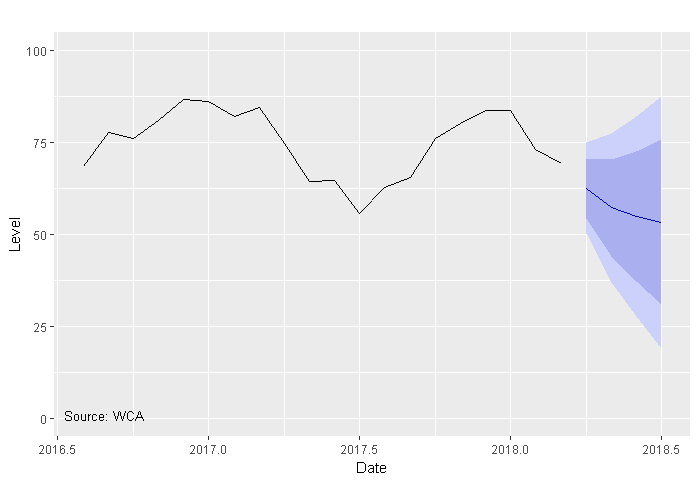 The WCA Fundamental Condition Barometer (Graph 1, below) shows a forecast path that remains above 50, but is declining. Our forecast base case is unchanged from last month, suggesting some stability after some weakening trends in February-March. Thus the near-term prospects for continued growth are good, but some moderation looks reasonable. This forms the primary justification for our near-term view to be tactically overweight equities in asset allocation portfolios. As a reminder, this process blends together more than two dozen individual indicators including financial market trends, domestic economic data, and foreign inputs. 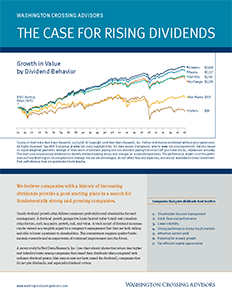 Our models assess the direction of each input and distill all of the observed trends into one number. The job of the barometer is to provide an unbiased answer to the question “Which way are trends generally pointing?” When we view sustained movements in one direction or another, across a wide field of observed indicators, we will take action in portfolios by shifting the mix of assets toward stocks and away from bonds, and vice-versa. In short, our tactical positioning tends to be more fact-based than opinion-based. With our barometer’s base case forecast (black line in forecast range) no different than last month’s, it tells us a few things. First, without further deterioration in risk appetite or incoming data, a near-term recession is less likely. Second, it implies that higher interest rates and trade tensions have not yet hurt the economy’s “animal spirits.” Lastly, it hints at the possibility of a moderating but steady growth scenario, which could allow for an extended period of non-inflationary growth. High Yield: Canary in the Coal Mine? Separately, we continue to closely watch spreads in the corporate bond and high-yield market as another test of investor confidence. A 20% rise in S&P 500 profit forecasts, combined with an expectation for significant repatriated funds from abroad, are encouraging signs for investors in credit and corporate bonds. The bottom chart, for example, shows the spread versus U.S. Treasuries for high-yield (risky) corporate bonds. As you can see, these bonds trade with very little additional yield versus Treasuries today when compared to the typical spread in the past. The current spread stands near 3.6%, closer to the low-end of the historic range. 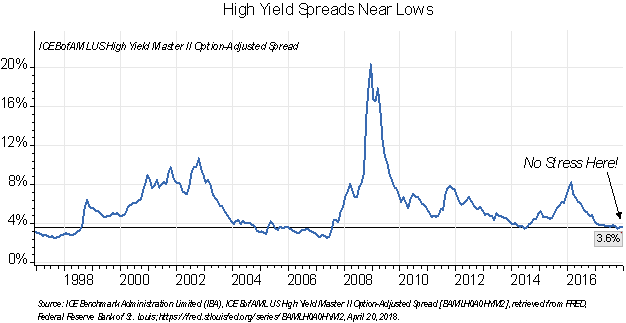 While tight corporate spreads may reduce the relative attractiveness of high-yield bonds compared to Treasuries, they also point to sustained investor confidence in the face of higher volatility. As long as such confidence remains intact, relatively inexpensive financing for new projects should remain available. This availability of cheap capital, in turn, could keep the music playing for a time longer. 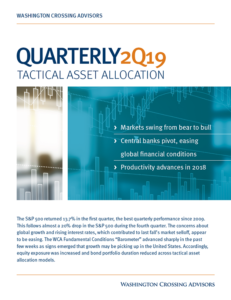 Because the forecast path of our barometer stabilized since last month’s update, we are making no adjustments to equity exposure in tactical portfolios at this time.